The CITYZER project develops new digital services and products to support decision making processes related to weather and air quality in cities. This includes, e.g., early warnings and forecasts (0-24 h), which allow for avoiding weather-related accidents, mitigate human distress and costs from weather-related damage and bad air quality, and generally improve the resilience and safety of the society. The project takes advantage of the latest scientific know-how and directly exploits the expertise obtained from, e.g., Tekes-funded (MMEA, RAVAKE) and EU-funded (HAREN, EDHIT) projects. Central to the project is the Observation Network Manager NM10 developed by Vaisala within the Tekes/MMEA project, on which CITYZER defines and builds new commercial services and connects new sensor networks (e.g., air quality). The target groups of the services and products (e.g., public sector, real estate and energy companies, and distributors) and related business models will be analyzed and developed in collaboration with local players (e.g., in India, South America, China) taking advantage of the pre-existing contacts by the Haaga-Helia University of Applied Sciences, Vaisala Ltd and CLIC Innovation. Service models are designed to account for and adapt to the special needs of different areas and customers. The developed services will be scalable, adaptable to (most common platforms) and responsive to the users? requirements. CITYZER project partners include Vaisala Ltd (weather observation instrumentation and products), Sasken Ltd (mobile products), Emtele Ltd (Portable IoT ICT Service Operation Center/Environment and remote intelligent cabinet for sensor network-GW and connections), HSY (urban services), Haaga-Helia University of Applied Sciences (service business models including digital services), Finnish Meteorological Institute (implementation of and scientific research on meteorological & air quality products), and the Tampere University of Technology (definition of and scientific research on air quality products), Pegasor Ltd (support for air quality instrumentation and products), INNO-W Ltd (business services support), as well as the CLIC Innovation Ltd as a subcontractor for arranging cooperation with international partners and project information dissemination, as well as composing the consortium agreement and other legal issues. The project is expected to have a wide variety of impacts. The business impact of this project to existing markets is estimated to be substantial and it will also create totally new markets especially for weather information related services. The existing whole target market size at this point is estimated to be several billion USD and the size of the market is growing steadily. The key CITYZER outcomes are the piloted services and products with envisaged great commercial and export potential. Development of the services will be managed by INNO-W supported by Sasken, Emtele, Pegasor and Vaisala. The national and international user profiling and market assessment will be led by Haaga-Helia supported by INNO-W and Sasken. FMI, Vaisala and Pegasor will use their expertise and current business relations to those foreign markets to speed up and guide the user and market evaluation. Essential potential players are local business school teams in Brazil and India that will be subcontracted to bring in local expertise in the user profiling and market assessment processes. 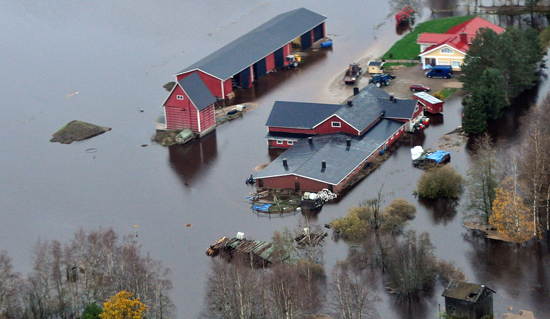 A serious flood situation on the farm in Kauhajoki, Finland caused by the severe weather. Photo: Pirjo Latva-Mantila.